Janome passed along some photos from the event, so I thought I'd share them with you too. 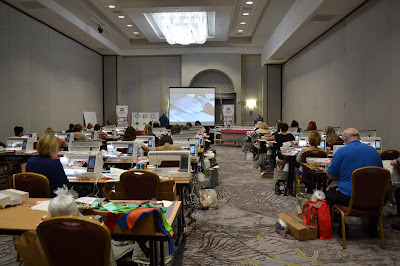 The Summit was my biggest class yet in teaching free motion quilting with rulers. 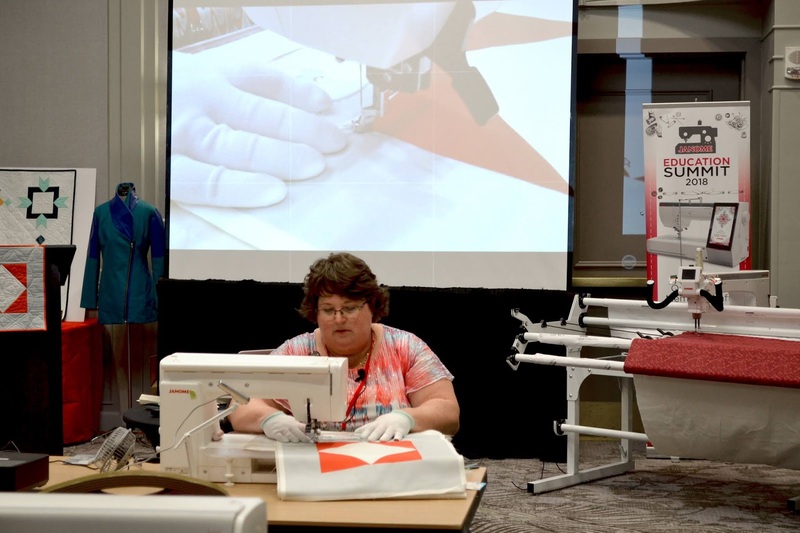 Thank goodness we all had the same machine (Janome 9400), ruler foot and the Janome Ruler Work Kit for our rulers. 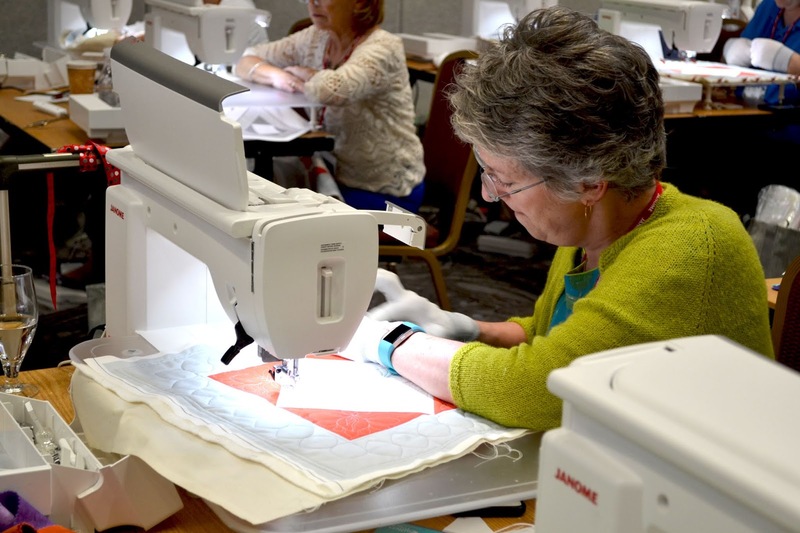 That made it a lot easier even though some of our participants hadn't done free motion quilting before. Here's a great shot of Sarah Ann Smith! It was an honor to have her in class as she's been an inspiration over the years. 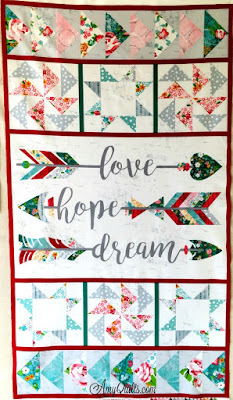 She totally did her own thing with the project and gave a fabulous write up on the quilting with rulers class segment on her blog. Have you seen the Jelly Roll Rug yet? Just had to make one of these fun things. 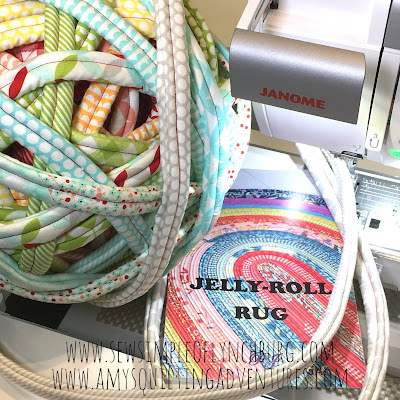 I used a jelly roll and two rolls of pre-cut batting strips, but it's an excellent project for using up scraps of batting. The trick to getting a nice flat rug instead of a ruffled thing my husband said looked like a swimming flounder is to make sure to sew on a large flat surface (pattern gives a suggestion how to set up machine next to a table if you don't have a machine cabinet) and to ease the fabric around the curves. I loved using my Horn cabinet for this. As soon as I returned from the Summit, I had to get cracking on my shop's Row by Row pattern and project. 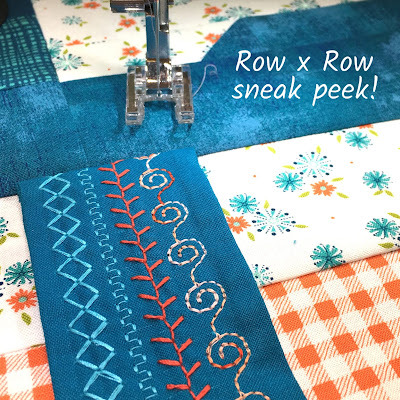 Row by Row (aka rxr) is like a giant shop hop, all across North America (possibly elsewhere? Unsure) where travelling quilters collect either free patterns or buy the kit from shops. If you are the first to show a finished "row" quilt with 8 patterns from row shops, to a participating shop, you will win a bunch of fabric. It's something really fun to add during your summer travels. My "row" is actually an 18 inch block as they are allowing different pattern sizes this year. I played with my machine's decorative stitches and a couple of different weights of Aurifil thread on it. I'll write up more about Row by Row closer to the launch date of June 21st. I'm really excited about this fabric line by Hope Yoder that we've got in the shop, especially the panel. I decided to order two more bolts of the panel in the thoughts that this might be the basis of my first either Quilt-along, or a new online class. I've got kits for this quilt featuring the panel in the shop right now, but I'll let you know more about what I want to do with it soon. Need to get the additional panels in before I launch something online. Speaking of hosting a Quilt-along or a new online class, I'm working on two big changes for you and my business/teaching. Ever since we bought our bricks and mortar shop, Sew Simple of Lynchburg, I've been neglecting this blog and my video making. I've been scattered in several places online too and it's been quite a juggling act. To make up for my lack of blogging and video making, I've been shooting more live Facebook videos and they certainly helped me feel more connected to you in my online audience, but I've really been spread thin. Live videos are fun and easy to do, but lacking when it comes to organized instruction. I finally reached out to a pair of mentors of mine and asked them what to do with my websites. I was afraid to hear how bad my sites were as I'm the one who set them all up, so they're a bit amateurish, though fit for my tiny budget. Their advice? It was that I need to condense the various sites into one site if possible and shorten the url. 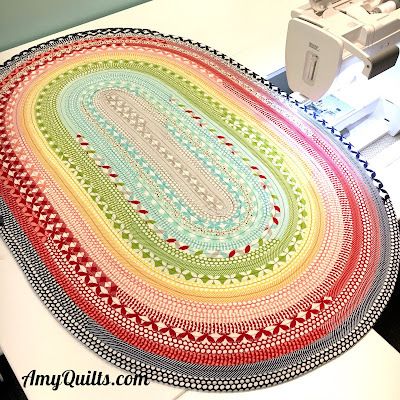 If you've ever heard me struggle in a video to say "I'm Amy from Amy's Free Motion Quilting Adventures," you know they're right! 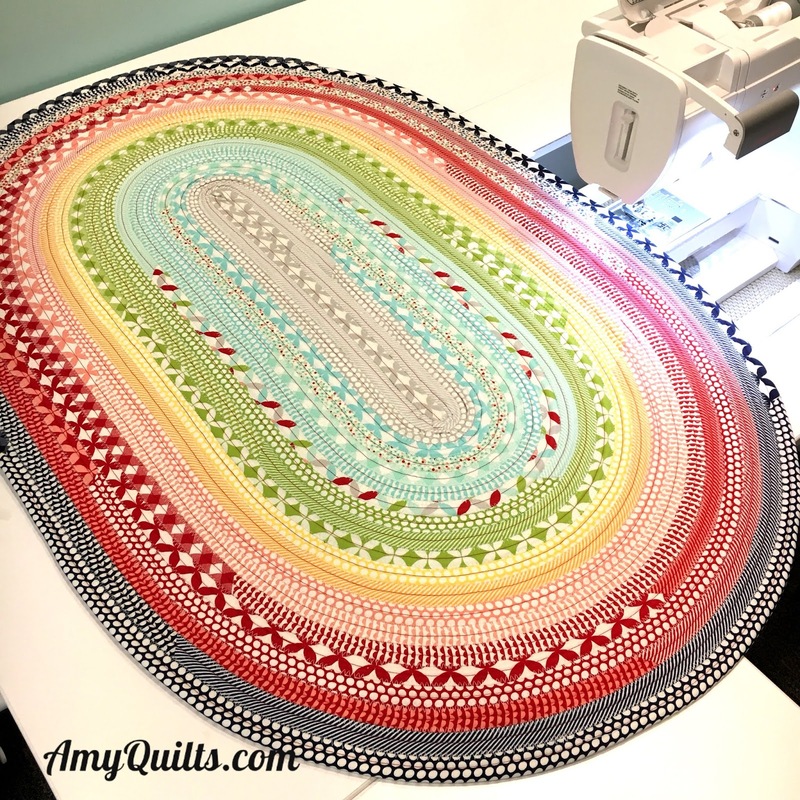 So....I'll be transitioning everything over to AmyQuilts.com! I'm excited about the change though it will take a lot of work and a bit of time to get everything moved. If you follow the blog via a feed reader like Bloglovin' or something else, I'll let you know when the blog makes the switch and you'll want to change your settings to the new blog. This blog will stay online, but I won't be adding to it once I make the switch. Lastly, I'm looking at doing some of my own online classes! These will fit somewhere between the highly scripted classes I did with Craftsy and my very casual, informal Facebook live videos, or even my YouTube videos. This will give me better control over the content I teach and how I teach it. Some classes will be free, others will be paid. All will be full of great information and taught in my laid-back style. I'm very excited about these changes and I hope you will be too! Let me know your thought in the comments. Thanks! Now to work the plan. Well now we're related, LOL!! Or maybe cousins?? You know the Christa Quilts and Amy Quilts clan?? (Suzy Quilts is part of the "family" too LOL!! I love new shorter concise name. Congrats!! Yes, totally related! There are so many Amys in the quilting world I was surprised it was even available. I like the Keep It Simple philosophy - for everything! When you upgrade your blog and new domain name, migrate this blog to it so you won't lose your subscribers. Thanks Carol. 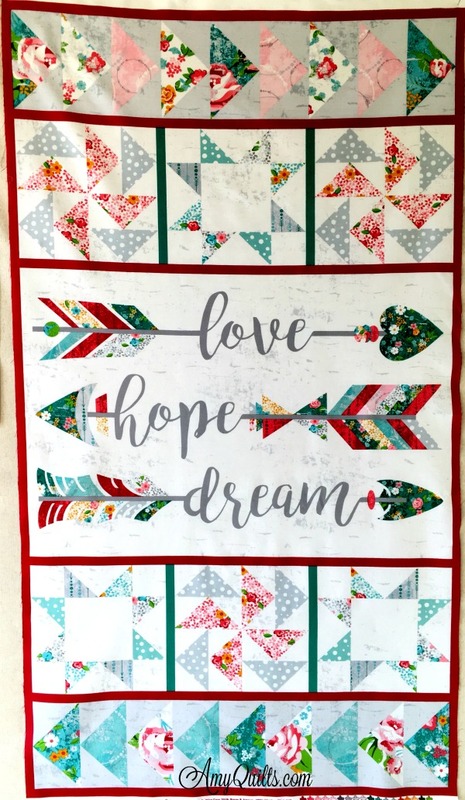 I've looked at migrating but the new AmyQuilts.com will be on the shopify platform which hosts our online shop and that migration isn't very effective. Yeah to the new plan! Your blog is very educational, inspirational, and a joy to read. I like keeping up with the Lynchburg quilting news too. It looks like you have a well thought out plan. 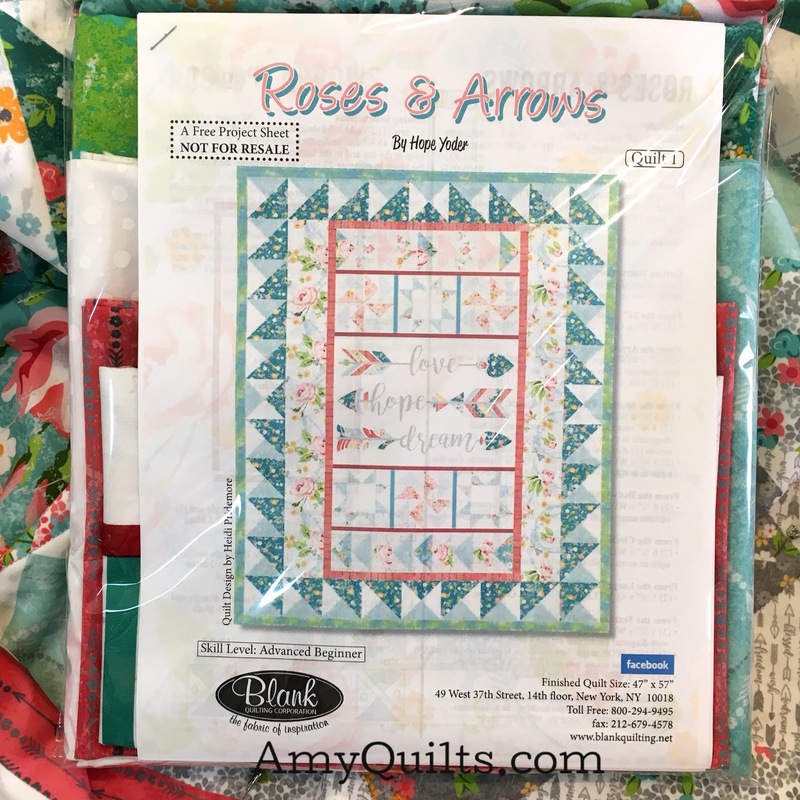 Looking forward to your new vision for AmyQuilts.com. Nice! I've followed you here & taken your Craftsy classes. Live FB video usually doesn't work for me. But I'm looking forward to watching you evolve and grow! I'm definitely always changing something up. I'm glad you're following along. Looking forward to your next adventure. I'm glad to go along with you!!! It's so much more fun to go on an adventure with others!